Bangkok Post is Thailand's and South East Asia's biggest and most respected English Language Daily Newspaper. Horizons is the Bangkok Post's weekly travel section. For those planning a holiday off the beaten track in serene and tranquil natural surroundings, the Chiang Dao Nest Mini Resort in Chiang Mai could be the ideal choice. The resort which opened last November is the brainchild of two enterprising people _ Wicha Cavaliero, a Thai and Stuart Cavaliero, an Englishman. Wicha is a professional chef who was trained for three years in England, working and training in a number of quality fusion restaurants. Stuart on the other hand has a background in retail management and more recently internet work. Chiang Dao Nest Mini Resort is situated in a very beautiful, peaceful, mountainous area, 1.5km from the famous Chiang Dao Caves. 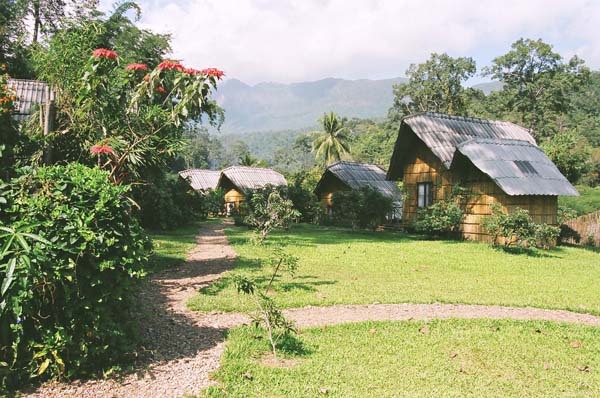 It comprises of six comfortably furnished bamboo bungalows, all with excellent mountain views. Separate shower/toilet facilities are to the highest Western standards of design and hygiene. 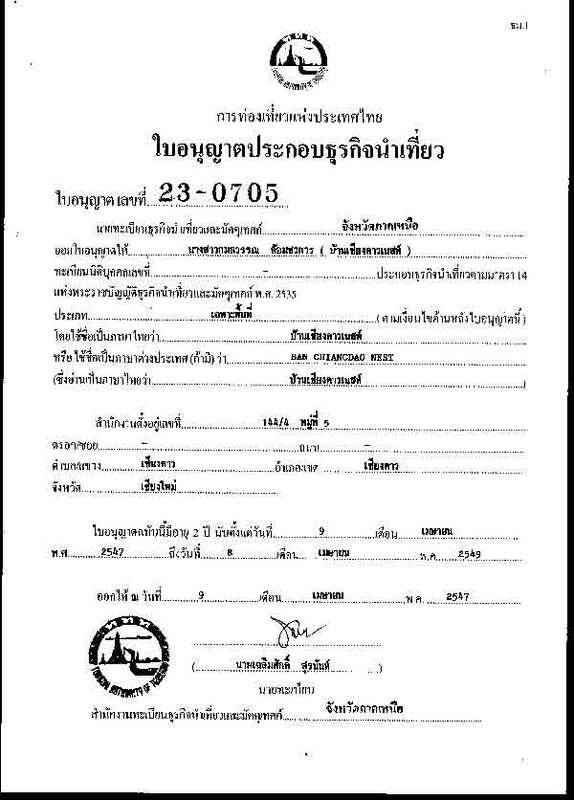 Room rate is 250 baht per bungalow per night, valid until November. Each bungalow can accommodate two persons. The resort's restaurant changes menu every night. Wicha, the chef uses seasonal local produce bought from hilltribe farmers around Chiang Dao to create fusion dishes, a mixture of Thai delicacies and European cuisine, the quality of which is normally reserved for five-star hotel dining. Vegetarian food is also served. It also offers a good selection of wines. Chiang Dao is increasingly becoming recognised as an important attraction for bird watchers. More than 300 species of birds can be found there. 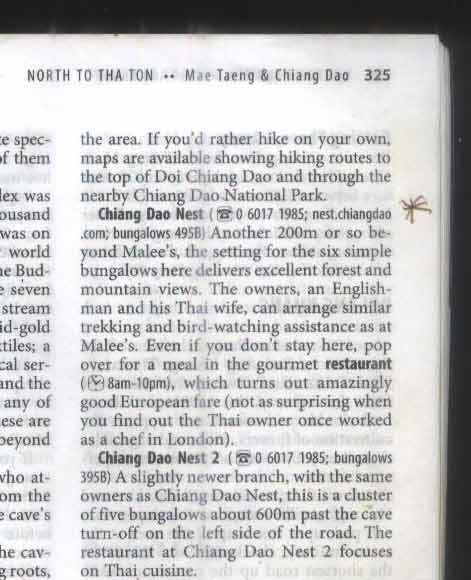 Chiang Dao Nest, located in the middle of a bird sanctuary, arranges tours for bird watchers, too. Besides, Chiang Dao Nest Trekking, in conjunction with a local guide, offers a different sort of nature trek. It is unusual in the sense that it does not focus on hilltribes, elephants or rafting, but mountain climbing. It regularly organises teams of climbers to scale the Doi Luang Chiang Dao peak, at 2245m from the sea level Thailand's third highest mountain. It's primarily directed at people who enjoy a challenge! Moreover, exploring Chiang Dao's town centre can be quite an educational experience, especially for big city folks. The town has charming old style wooden shops flanking the main highway.and it is one of the few remaining towns in Thailand without a Seven Eleven store. On Tuesdays people from surrounding areas, including hilltribe people gather in Chiang Dao at a makeshift market to display and sell their wares. Ideally, not meant for tourists but still the market is worth the experience. For those visiting Chiang Dao the town could serve as a perfect springboard for travel in the region. No matter how you prefer to travel _ on foot, by bicycle, rented cars, or on motorbikes, Chiang Dao can provide it all and at very reasonable prices. Elephant centres and rafting facilities are situated in this vicinity of the resort. A diverse mix of ethnic hilltribe people inhabit the surrounding mountains and they can be reached individually or in groups. They are all located within a convenient trekking distance. There are also hiking trails through the forest and up the mountains. The resort is a great place to unwind. You can meditate at the temple, relaxing in your hammock, drink your favourite beer or read a book, it's such a peaceful place that doing nothing is a serious option here. ''We can arrange tours to the elephant camps and rafting in bamboo barges, we have it all,'' said Mr Cavaliero. Since its opening three months ago, the resort has been attracting people who have a taste for places that are not too heavily leaning towards tourist money. ''We have also received some adventure and bird-watching groups. 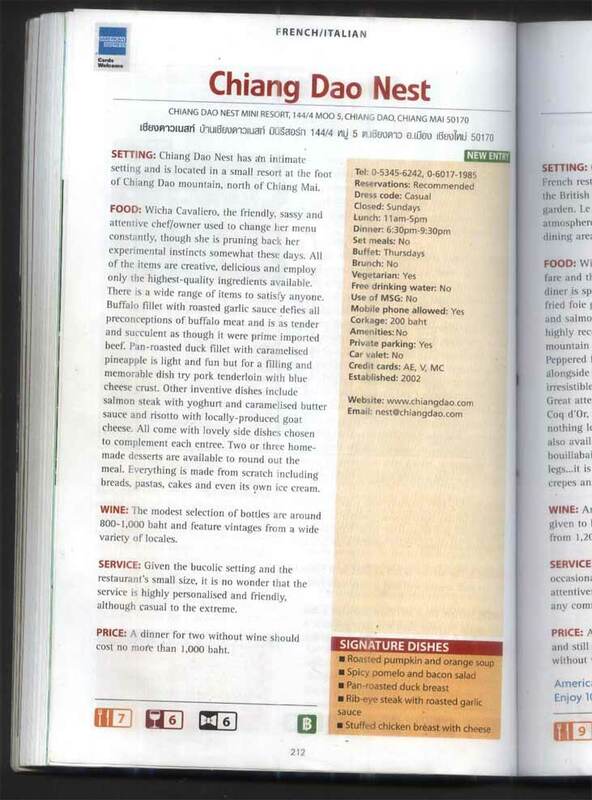 Expatriates living in Chiang Dao and Chiang Mai city have sampled food at our restaurant and have left content. Editors note: Our prices are no longer at this rate, and we now have rooms available with private facilities, please click here for current details. I also strongly deny that I ever said "We have it all"!